A controversial 1,000-room palace built for Turkey's president will cost even more than the original £385m ($615m) price tag, the BBC has been told. Officials said the additional costs are due to a new 250-room private residence for President Recep Tayyip Erdogan, and thousands of imported Italian trees. The inflated bill is set to add several million pounds to initial estimates. 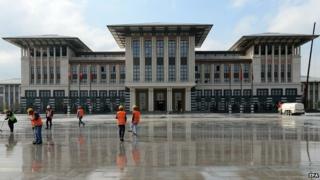 Known as Ak Saray (White Palace), the new building is perched on a hilltop near the capital Ankara. Constructed on more than 150,000 sq m (1.6 million sq ft) of land, it was opened by Mr Erdogan on 30 August after he became president. Bigger than either the White House or the Kremlin, it had already cost more than twice the original estimates of treasury officials. Speaking to the BBC, the Ankara Architecture Chamber said the latest price hike was in part due to thousands of trees which have been imported from Italy to be planted in the palace grounds. The price of the trees was not included in the original bill, and each tree costs between £2,400 ($3,750) and £6,400 ($10,000), the chamber said. The BBC's correspondent in Turkey Mark Lowen said the new palace is now seen as an example of the extravagance and omnipotent style of Mr Erdogan, whose AK Party has dominated Turkish politics for more than a decade. The project has also been lambasted by the political opposition, which pointed out that the monthly electricity bill alone - likely to be footed by the taxpayer - will reach £200,000 ($313,000). The president has called the palace a "show of the country's prestige".